At Palace Farm we are committed to providing excellent quality eco hostel accommodation, minimising the environmental impact of our activities. 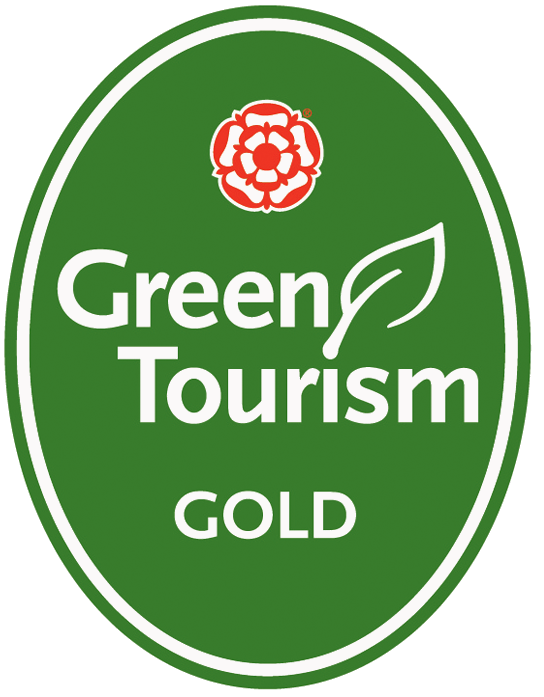 A symbol of this commitment is our membership of the Green Tourism Business Scheme. This scheme provides accreditation and encouragement for tourism businesses to reduce the environmental impact of their activities. By encouraging sustainable practices it ensures the continued enjoyment of the environment of England for future generations. In the Courtyard rooms of the eco hostel we have used mostly low energy lighting, thermostatic radiators, where possible exceeded the insulation requirements, and installed solar water heating and a "clean burn" log burning stove to burn waste wood from the farm, and we are already saving far more than £1,000 per year in fuel bills. For our final phase of conversion, the granary of the eco hostel, we were determined not to use fossil fuels for heating. Completed in 2011 the building is very successfully heated using an air source heat pump with under-floor heating and solar panels for all the hot water. Insulated to a very high standard we have not needed to light the wood burning stove we installed for back up warmth! The campsite has a modern environmentally friendly toilet and shower block, all lighting is low energy and lights in toilets and showers are switched on by PIR sensor and automatically turn off when all movement has stopped for several minutes so we don't waste any electricity. The lights on the outside of the block are switched on and off by a light sensitive switch, the total consumption is just 160 watts, that is six and a quarter hours per unit of electricity. During the renovation of these typical Kent farm buildings we have saved and reused much of original building materials to be environmentally friendly. Our fencing is made from locally grown Kent coppiced chestnut and when it needs replacing the old fence can be burned on the wood burner to help heat the hostel. We encourage all of our guests to recycle glass, plastic, metal and paper. To make it easy we have recycling bins in the eco hostel and in the camp site. We have researched wind generation and the use of a small solar PV panel to light the covered patio area and other outside seating areas. Although we do have electric lights to most of these areas 230 volt electrics needs an electrician to install, with a 12 or 24 volt system we will be able to put in lights ourselves and explore different lighting moods. Palace Farm is a working farm growing Wheat, grass to be made into hay and silage, we have our own fully free range chickens and when we can find them enjoy some wonderful eggs with bright orange yolks, these may be available to our guests in season. In past years the farm had been meticulously manicured, weed killers were used liberally between trees and under hedgerows. In orchards closely mown grass separated bare earth strips in which only the fruit trees were allowed to grow. Following a visit that we requested from a conservation consultant we reverted to leaving the weeds under hedges unsprayed this has greatly increased the stock of natural insect predators, we seldom use sprays for pest control now. These efforts have made a huge difference to the wildlife on the farm. there is one big drawback – rabbits everywhere!